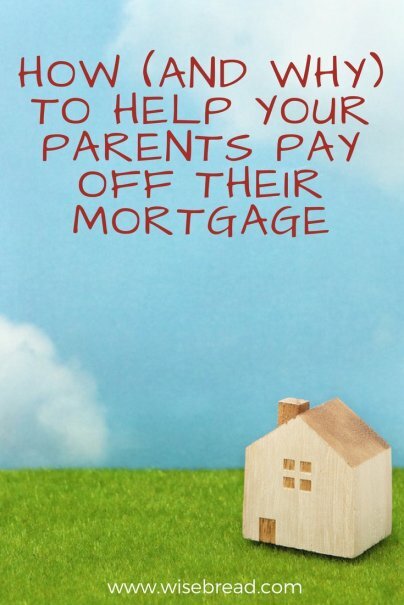 Your parents have a fair chance of carrying a hefty mortgage well into retirement. According to a Newsweek article ("Many Baby Boomers May Retire with Mortgages"), 63% of 55- to 64-year-olds have a mortgage. Some may be close to paying off the mortgage, but my observations and research lead me to believe that many of these homeowners (in some cases, the parents of 20- and 30-somethings) have a mortgage loan balance that is frighteningly close to the value of their property (in 2009, a New York Times article indicated that about 15% of those 55- to 64-year-olds are underwater, as are 30% of homeowners in the 45-54 age range). If your parents happen to carry a large balance after several mortgage refinances, and they adhere to standard repayment schedules, they may be in their 80s before the mortgage is paid (read why you should care about their finances). A major part of the rationale behind extreme borrowing was that your parents would eventually sell the house, pay off the mortgage, and use home-sale proceeds to buy a smaller home outright and supplement savings. The fall in housing prices may have made them rethink the timing of the home sale, but what also may be holding them back is the now-grown kids’ desires to return (perpetually) to the homes of their youths, either in the form of primary residences or vacation homes. Even if they can’t sell their homes for as much as originally envisioned, they can still extract themselves from a hefty mortgage and homeowner expenses, such as HOA fees, utilities, upkeep, and property taxes. Don't be nostalgic about the house if your behavior and words will stop your parents from selling. Consider new ways that the family can reunite over holidays and vacations. If they start planning now, they’ll be more likely to sell the house and buy a suitable one with a much smaller mortgage (or none at all) within the next few to several years. While you’re encouraging the downsizing, help them get rid of stuff. One of the things I’ve noticed that’s been a problem with my parents (and my in-laws) in de-cluttering is that the kids want to keep their stuff at mom-and-dad’s house. Take it with you! Secondly, help them sell or donate (and claim a tax deduction) on valuable-but-unnecessary things to ease the move to smaller space. Your parents may offer to pay for your graduate degree, especially now that they do not have expenses associated with groceries, medical and dental bills, clothing, and more for a growing family. If your career is stagnating and they seem relatively successful, then you may be considering approaching them for assistance. To fund graduate school, they may need to tap a home equity line of credit. Even if they have funds to pay your expenses, encourage them to use extra money to accelerate mortgage payoff or tuck away dollars for unexpected expenses. Explore options to pursue a graduate degree on a budget, which may include taking classes on a part-time basis, getting tuition reimbursement from your employer, landing a fellowship, and winning scholarships. These approaches may put you in a better position to snag your dream job after graduation than if you had quit your job and borrowed money to attend grad school. If you are living at home and working in any capacity, pay rent. Pay enough to cover incremental costs associated with your share of utilities, groceries, and incidentals, plus an extra amount that will allow them to pay down the principal on the mortgage. Admittedly, I didn’t pay rent to my parents when I graduated from college and lived at home because I was still looking for a job and had no source of income (or thought I didn’t). Within four months, I moved away, started paying rent to a landlord, and eliminated expenses associated with my upkeep. Pay a portion of the expense for the vacation home that your parents may arrange for the family get-together, or take care of meals and activities. If the vacation is solely your parents’ choice and you have no input on the location, make alternative plans or see if your parents are open to changing the venue if you share expenses. Pay for childcare and babysitting, or find ways to compensate them without handing over cash. Bring meals, handle repair jobs, or find bargains for them. Some grandparents may watch their grandchildren infrequently and could be upset at offers of money. Others, though, are regular caregivers and will appreciate some extra cash. They may have child-related expenses for snacks and meals or simply have less time to engage in money-saving activities such as bulk cooking or doing their own yard work. Having a frugal wedding may seem natural or outrageously unacceptable depending on your social circle and demographics. Note that your parents may need to borrow to pay their portion of wedding-related expenses. Setting a reasonable budget and spending on what truly matters are keys to the elegant-but-frugal wedding. Some folks may host relaxing rehearsal dinners at private homes. Others eliminate traditional expenses but splurge on cost-effective wedding alternatives. It’s likely that parents and their now-grown or nearly grown children can collaborate on cash-producing and money-saving projects. When my youngest son was 11-years-old, we worked together to sell Yu-Gi-Oh! cards online (not that I’m perfectly capable of tackling this task independently). He provided insights into buying motivations of consumers and handled certain aspects of listings (such as selecting cards and taking digital images) while I took care of the financial matters (purchasing supplies, advising on costs to fulfill orders, and managing the financial settlement account). You can also help each other save money by sharing expertise, perhaps through online and brick-and-mortar bargain-shopping expeditions or hands-on cooking lessons. Carrying a mortgage into retirement may not seem all that bad, especially if social security checks will cover the amount. But if parents have to take withdrawals from retirement accounts to cover basics like housing, then they’ll pay taxes and deplete savings at an exponentially higher rate than if they’d knocked out the mortgage prior to retirement. That is, they'll pay taxes on retirement fund withdrawals (generally considered ordinary income, unless they've socked away money in new Roth IRAs), which can trigger taxes on social security income that will then lead to selling more assets to pay the extra taxes, and so on. According to Schwab MoneyWise, 44% of retirees are supporting other people and though most young adults are financially independent, “41% of parents still provide some level of financial support to their children ages 23-28.” Judging from articles on their financial priorities (such as this discussion on college savings vs. retirement), those now in their 20s and 30s are determined not to make the same mistakes as their parents. Priorities include containing or eliminating the parent-to-child money flow. Learning how these mutually responsible relationships should work doesn’t have to start when you explain the need for financial independence to your 18-year-old as she packs for college but can start by modeling financial independence now. You may have some angst about your future, and you may wonder why you can’t afford what your parents did, which may have included private school tuition, a large and well-appointed home, and frequent meals out. But if you can take a peek behind the curtain, then you may discover that they incurred too much debt and really couldn't afford some or all of these expenses. These realizations may guide you as you make decisions about spending and saving. "You may have some angst about your future, and you may wonder why you can’t afford what your parents did..."
We have angst not because we can't afford what our parents have, but because our parents couldn't afford it either! They have had the last thirty years of fictitious prosperity to live far above their means, and now they want us to help pay for it. It is irresponsible and absurd to the highest degree. The young workers of today understand that they will burden the costs of out-of-control entitlements. Social Security, Medicare, and Medicaid are entirely unaffordable, yet we will be asked to pay for them knowing that the chance of us getting to benefit from them is slim to none. The Baby Boomers have sold their children down the river. Generational warfare is coming. "But if you can take a peek behind the curtain, then you may discover that they incurred too much debt and really couldn't afford some or all of these expenses." I'll note that some baby boomers have paid off their mortgages. Wow. Our folks didn't pay for our university education or our wedding. Nor did we expect them too. We were out of the house by age 18 and 19 respectively. No kids yet so no chance to pay for child care. Family vacations never occurred due to financial circumstances. I'm not sure this article was written for those aside from the middle/upper-middle class. That being said, Mrs. SPF and I both have good jobs and we live comfortably. Our largest challenge is getting our parents to discuss their financial situations openly so we can ensure that we can assist them if so required. Great! I know some kids (now grown) who help support their parents by sending them money on a regular basis, which I find admirable. I doubt they ever had vacations either. Collaborating on ways to better manage finances may be more suitable for your situation. One tip on discerning a financial situation before it becomes major problem is to study their responses to crisis situations involving money -- do they have funds available or do they need to take out a loan, for example. Great article and great perspective! I can't believe so many parents of my generation burden themselves with thousands in college loan debt, the cost of extravagant weddings, and support their adult children so they can live a lifestyle the parents worked thirty years to achieve. I also help one of my young adult children who lives on her own, paying for gas and food, so she can attend school part-time. I know a couple of friends that help to their parents as well. It is nice. I don’t think it can do much harm to their budgets. But sometimes it is in opposite way too. Well, not everybody cares about the future in their 18 years age. It is good to guide children to build up their career as soon as possible and teach them to financial discipline and frugality. According to the idea to sell bigger house and move to the smaller one to lower expenses is probably the best advice I can give now either.